Do not press your eye hard against the HWTS eyepiece while engaging a target. The M2 kicks back slightly and could harm you. Secure the M2 as well as you can to increase accuracy and to help prevent injury. (1) Place the M2 in the ready-to-fire position 10 meters from the boresight target offset. To avoid a failed boresight zero, level the target and weapon before you adjust the laser. NOTE: The HWTS will not focus in on a silhouette copied to plain paper. To create a boresight target offset, use a 25-meter M16 zero target and attach to it a copy of the boresight target offset. (2) Mount the HWTS and boresight the weapon. Set the M2 mount to the NEAR position. (3) Use the reticle select switch to change to the M2 reticle. The reticle type displays in the upper right corner on the raster. (4) Make adjustments with the T&E until the bore light moves onto the bore light aiming point on the boresight target offset. (5) Adjust the reticle with the reticle adjuster on the right side of the HWTS. Remember to hold the adjuster down for a count of five. Press and hold the adjuster up to move the reticle up, down to move the reticle down, forward to move the reticle left, and back to move the reticle right. (6) Use the vertical and horizontal reticle adjuster to move the 1,000-meter aiming point of the reticle to the HWTS aiming point on the boresight target offset. (7) Recheck the bore laser point of aim and make sure the reticle remains in the center mass of the HWTS aim point on the boresight target offset. When using night optics, M2 gunners use night initial training strategies. Additional nonfiring exercises also apply. f Qualifications. Changes to M2 qualifications accommodate new night vision sights and laser pointers. Using the new tables reduces the time and ammunition required to train and qualify gun crews. Lack of ranges and other resources previously limited qualification options. The new tables increase the opportunities for qualification and the flexibility in the process of qualification. Simpler scoring and grading procedures allow gunners to maintain a high level of proficiency. (1) With the availability of night vision sights and laser pointers, the current night standards are not challenging. Taking into consideration the "own the night" concept, gunners need to qualify at night to the same or a greater standard than we do during the day. Using these proposed qualification tables and training strategies, the gunner can do so. Each night practice and qualification table has three variations, to reflect the different range, weapon, and sight combinations. Each day table has a variation for each type target. (2) Use the training strategies and preliminary marksmanship instruction previously described to prepare for day practice and qualification tables. Graders need to prepare, and to ensure ranges are prepared, in accordance to the latest published manuals on the subject. After the gunner trains, he should use Firing Table I then Firing Table II. If he fails to meet the standards in Firing Table I, he must repeat the training and fire the table again. Gunners must pass the practice table before moving on to the qualification table. (3) The gunner must pass day qualification before proceeding to night qualification training. g. Nonfiring Exercise. Use this exercise to train the gunner to use the T&E in order to sight the laser on target. (1) Place the M2 in the ready-to-fire configuration, with the sight mounted on the M2, and with the M2 mounted on the M3 tripod. (2) Have the gunner close his left eye and look into the sight with his right eye. (3) Tell the gunner to focus on a target in either the narrow or wide field of view. (4) Tell the gunner to close both eyes. After he closes his eyes, you, the trainer, must turn and change the setting on the sight. (5) Tell the gunner to achieve the same sight picture he had before you reset it. (6) Look through the sight to ensure the gunner has acquired a clear sight picture. If not, show him how to get one. (7) Repeat the exercise until the gunner achieves proficiency with the sight. h. T&E Manipulation and Aiming Exercise. Use this exercise to train the gunner to manipulate the T&E, acquire targets, and properly sight the target based on the target range. This exercise also trains the gunner to use the mounting bracket to adjust for range. (1) Set up two to three targets that the gunner can acquire with the HWTS using the T&E. (2) Regardless of the actual range to the target, tell the gunner to sight in on the first target and give him the range you want it to be. (3) Ensure the gunner sets the mounting bracket to the correct setting and uses the T&E correctly. (4) Time the gunner as he conducts this exercise, and create a competition between the gunners in training. i. Practice Qualification. Use practice qualification, modeled after the day qualification scenario, to transition the gunner into engaging multiple timed targets at various ranges. (1) Place the M2, with HWTS mounted, in the ready-to-fire configuration on the M3 tripod. (2) Have the gunner close his left eye and look into the HWTS with his right eye. (4) Tell the gunner to close both eyes. After he closes them, change the setting on the sight. (5) Tell the gunner to open his eyes and to achieve the same sight picture he had before you reset it. (7) Repeat the exercise until the gunner reaches proficiency with the sight. Gunners use the AN/TVS-5 (Figure G-3, page G-7) a portable, battery-operated electro-optical instrument, to observe and aim weapons fire at night. The AN/TVS-5 amplifies reflected light such as moonlight, starlight, and sky glow, making the scene clearly visible to the operator. The sight does not emit visible or infrared light (except from the eyepiece) that the enemy can detect. By using this device, the gunner can observe the area, and then detect and engage any suitable target. The quality of the zero determines the usefulness of the weapon. Accurate zeroing requires practice. 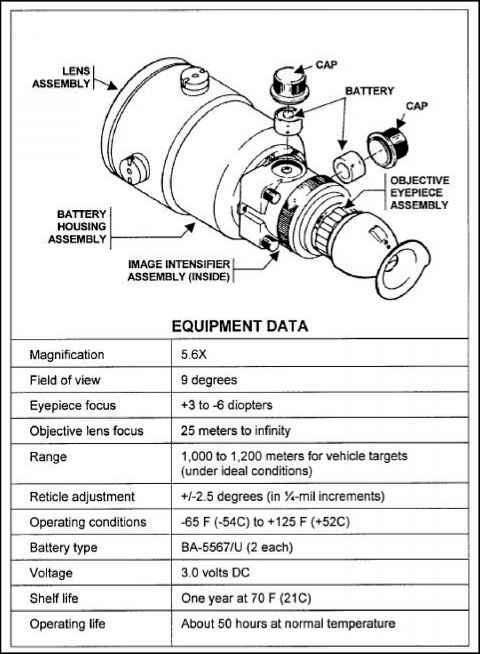 Figure G-3 also provides equipment data for the AN/TVS-5. Figure G-3. AN/TVS-5 components and data.